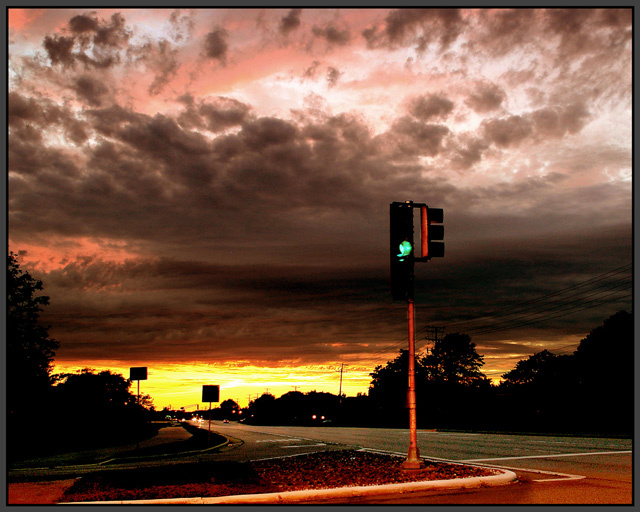 The stoplight is really necessary in my opinion.. it takes the 'armageddon-feel' of the picture closer to your own home because of it.. thus making it (a lot!) stronger. Use of text would (indeed) have made it an even better album cover (wich was the general idea ;)) so i rated it 9 and am very suprised to see this end so low! Shame on those 143 voters that rated this below a 6.. In this shot, I am drawn more to the sunset in the back of the shot. That said, there are several elements that attract attention and lend themselves to be slight distractions - the stoplight, imho is unnecessary, but I like the curver and perspective lines created by the street. I guess I'm not sure what I would change with this shot. The pink clouds are attractive, possibly a closer crop on that would work. awesome picture dude! excellent work! ! love that cloud formations!! Cool picture. Slightly blown out in sky near the horizon. Still I like it. No text will hurt this entry. Definitely a neat picture, but a little safe for the challenge if you ask me. I don't feel like the border is really adding to the picture. For me, it's actually taking away from it. i like the reddish-orange hue on the stop light and street. Nice shot with a good balanced composition. Proudly hosted by Sargasso Networks. Current Server Time: 04/26/2019 03:39:17 AM EDT.